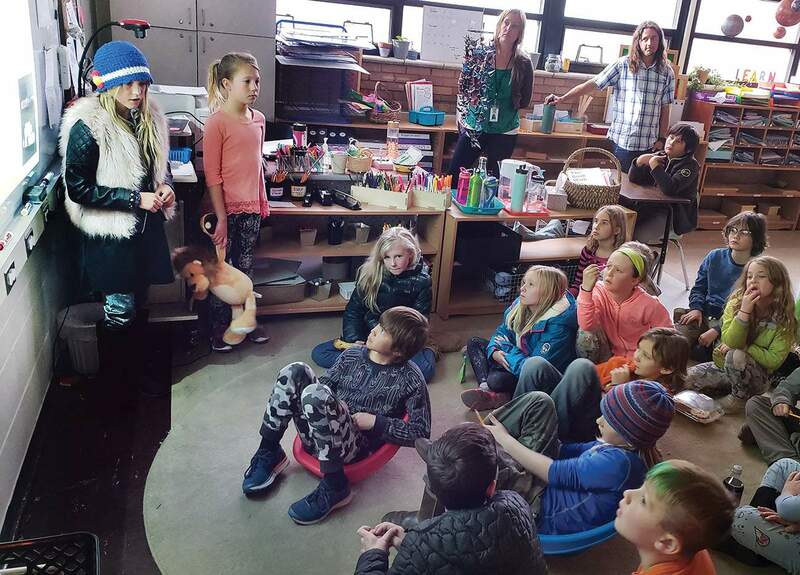 Adaira Nachtrieb, 9, left, gives a presentation about having Type 1 diabetes to a class of fourth- and fifth-grade students at The Juniper School. Nachtrieb also gave the presentation to her own fourth-grade class at Needham Elementary School. Adaira Nachtrieb, 9, passed out the day she was diagnosed with Type 1 diabetes, she told an attentive group of her peers late last year. “I had to drink a lot of water and was really thirsty and emotional,” she told a class of fourth- and fifth-graders at The Juniper School. She recalled being “pretty healthy” before her diagnosis with Type 1 diabetes, an autoimmune disorder. The fourth-grader also fielded question after question about diabetes from students, unwaivering in the face of their unfiltered curiosity. “How long will you live if you are not treated?” a student asked Adaira. Adaira responded she would not live very long, even without eating carbohydrates. Diabetes is a growing problemAdaira is among an estimated 23.35 million people in the U.S. diagnosed with diabetes, according to a report by the Centers for Disease Control and Prevention. It is estimated 100 million U.S. residents have diabetes or prediabetes. Those with prediabetes have elevated blood sugar levels and are at risk of developing diabetes. The vast majority of Americans have Type 2 diabetes, a preventable and reversible condition, and have developed a resistance to the insulin their pancreas produces. Insulin is a hormone needed to regulate blood sugar, it is like a “gatekeeper” that allows sugar into cells, said Dr. Josette Miller, an internal medicine physician at Animas Surgical Hospital. According to the CDC, about 5 percent of Americans with diabetes have Type 1 and either cannot produce insulin at all or cannot produce enough insulin to regulate their blood sugar because their immune system has attacked cells in the pancreas that produce insulin. Type 1 diabetics must rely on insulin treatments for life, Miller said. The number of diabetes cases has grown sharply since 2000 when 12.05 million U.S. residents were diagnosed with the disease, according to the CDC. In Southwest Colorado, diabetes was identified as one of the three major health concerns the region is facing, according to the Southwestern Colorado Area Health Education Center. It is a particular concern for members of the Southern Ute Indian Tribe and the Ute Mountain Ute Indian Tribe, said Mary Dengler-Frey, regional health connector for the center. The rise of the disease is among those with Type 2 diabetes who have developed a resistance to the insulin their body is producing. As a result, high blood sugar and the damage it does to a patient’s body can leave them with significant consequences, such as blindness, kidney failure and need for dialysis. People who are overweight with a body mass index over 25, live a sedentary lifestyle and have a family history of diabetes have an elevated risk of Type 2 diabetes, she said. Those at risk for diabetes can have their blood tested by a primary care doctor. The test can reveal whether a patient’s red blood cells are being damaged by high levels of sugar, she said. At the request of The Durango Herald, Miller also added some nuance to some misconceptions Adaira addressed. There is some truth embedded in the statement “you get diabetes from eating too much sugar” for those with Type 2 diabetes, but it is not so simple, Miller said. “It’s not just a few sweets, it’s your entire lifestyle altogether. So if you’re eating too many calories, especially high carbohydrate calories that can increase your insulin resistance,” she said. It is not that “people with diabetes can’t eat sweets,” but to manage their condition, those with diabetes need to track their sugar intake and manage it with insulin, Miller said. Living with Type 1 diabetesThe notion “people with diabetes can’t eat sweets” is a misconception that Juniper School teacher Andy Gernhart encounters regularly. Gernhart was diagnosed with Type 1 diabetes as a teenager. He said he regularly feels like other people are judging what he is eating. He also faced many of the same challenges as Adaira and others who are growing up with Type 1 diabetes, such as learning to give himself insulin injections and managing his sugar levels with food. “It’s something that is constantly on your mind,” he said. Those with Type 1 diabetes can get seriously ill fast without insulin, Miller said. The lack of insulin can cause a ketoacidosis, which is an acid-based disturbance in the blood and can require time in a hospital’s intensive care unit. Those with Type 2 diabetes tend not to become as seriously ill without insulin injections because their pancreas is producing some level of insulin, she said. People with Type 2 diabetes can also reverse their condition through diet and exercise, Miller said. For Gernhart, learning to be open about his diabetes was a process. To support children with Type 1 diabetes, Gernhart is starting a social group to “get families and kids together and let them know they are not alone,” he said. He said he hopes the students and their families can share their challenges and tricks for taking care of Type 1 diabetes through the group. A social group for Type 1 diabetics and their families will meet at 3 p.m. Jan. 26 at the Durango Community Recreation Center, 2700 Main Ave.